This article is about the head of the Communist Party of China since the 12th Central Committee in 1982. For the Leader of the Communist Party between 1921 and 1982, see Leader of the Communist Party of China. The General Secretary of the Central Committee of the Communist Party of China (Chinese: 中国共产党中央委员会总书记) is head of the Communist Party of China and the highest-ranking official within the People's Republic of China. The General Secretary is a standing member of the Politburo and head of the Secretariat. The officeholder is usually considered the "paramount leader" of China. Since the abolition of the post of Chairman of the Communist Party of China by the 12th Central Committee in 1982, the General Secretary has been the highest-ranking official of the party and heads the Central Secretariat, Political Bureau and its Standing Committee. Since its revival in 1982, the post of General Secretary has been as de jure government position, the most important post in the PRC, though it did not become the de facto most important post until Deng Xiaoping's retirement in 1990. As China is a de facto one-party state, the General Secretary holds ultimate power and authority over state and government. However, the men who have held the post have held far less power than Chairman Mao Zedong. Since the mid-1990s, the General Secretary has traditionally also held the post of President of the PRC. While the presidency is nominally a ceremonial post, it is customary for the General Secretary to assume the presidency to confirm his status as de jure head of state. 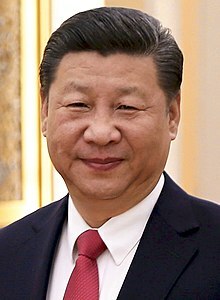 Since Xi Jinping's ascendance to power, two new bodies of the Communist Party, the National Security Commission and Central Leading Group for Comprehensively Deepening Reforms, have been established, ostensibly concentrating political power in the "paramount leader" to a greater degree than anyone since Deng. These bodies were tasked with establishing the general policy direction for national security as well as the agenda for economic reform. Both groups are headed by the General Secretary, thus the power of the General Secretary has become more concentrated. For a more comprehensive list, see Leader of the Communist Party of China. This page is based on the Wikipedia article General Secretary of the Communist Party of China; it is used under the Creative Commons Attribution-ShareAlike 3.0 Unported License (CC-BY-SA). You may redistribute it, verbatim or modified, providing that you comply with the terms of the CC-BY-SA.